Welcome to 3106 Old Dominion Boulevard in charming Beverly Hills! Prime location and expansive lot are just the start to this move-in ready 4 bedroom, 3.5 bath home offering over 2,500 square feet of above-ground living with a spacious basement ready for your touch. Residing in the sought-after Alexandria neighborhood known as Beverley Hills, this must-see home won’t be available long at this price point. Hardwood floors grace the entire house. The main level hosts a bedroom with en suite bathroom - perfect as a grandparent’s suite, nanny quarters or a cozy escape for overnight guests. The original living room, with a wood-burning fireplace, is adjacent to a brightly lit sunroom – ideal for a home office or peaceful reading room. Further back on the main level is a recently expanded open-concept kitchen with a large island and separate breakfast nook surrounded by windows that flood the space with natural light. This entertainer’s kitchen opens to the generously sized great room which flows to a large dining area, and contains a second wood burning fireplace. A mudroom with half-bath complete the main level. The second level features a large master suite with two walk-in closets, bathroom with shower, separate soaking tub and dual vanity. Two more bedrooms, one with a “secret room” (great for a playroom or additional storage) and another full hallway bath complete the upstairs. The fenced-in backyard offers a slate patio for entertaining, space for kids (and pets) to play, and a neutral canvas for a green thumb’s creative vision. Storage for yard equipment, tools and bikes can be found in the shed. With approximately 400 square feet of unfinished basement, this water-proofed and expansion-ready area provides for more storage or the opportunity to create additional play or sleeping space. 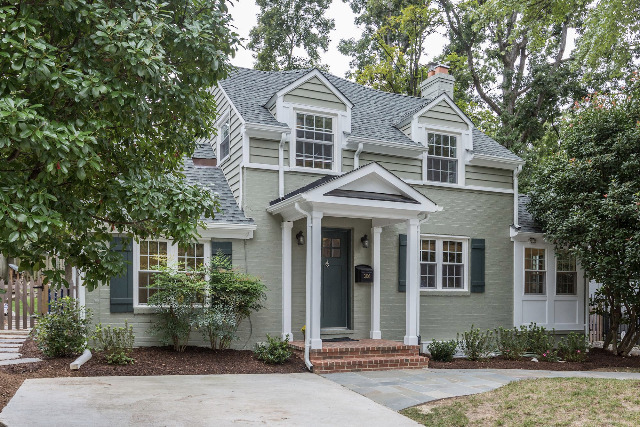 Enjoy a short bike ride or walk to Del Ray, Shirlington and Old Town. Easy access to 395, Pentagon, National Airport and all commuting routes, make 3106 Old Dominion Boulevard an oasis within minutes of DC. Simply perfect - welcome home! QUESTIONS? Reach out to Melody.Abella@SothebysRealty.com or text 703-371-9219. Offer deadline is Monday 10/15 - 6pm. Take South Glebe Exit off 395, stay right to get on West Glebe, turn right on Old Dominion Blvd. From King St Metro, go N on Russell Road, Left on Monticello, Right on Old Dominion.